The character of modern cities is transformed each century. Metalled roads, steel railways and industry changed the genteel cities of 1800 into the industrial cities of 1900. 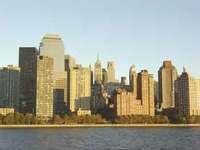 Concrete, glass and commerce produced the towering cities of 2000. But what character will the cities of 3000 have? We believe the most visible change will be a vast increase in the quantity of vegetation within city boundaries. The territorial boundaries between gardens, parks and architecture will dissolve. Roofs will be vegetated, walls will be planted, there will be many more street trees, cities will grow more of their own food. Architecture will become landscape and landscape will become architecture. Cities will be green in character, and more sustainable. In a city of tall buildings, ground level space tends to be hostile to pedestrians: shady, gusty, overlooked and polluted. Roof space, by contrast, can be quieter, sunnier and more-private, as well as having the potential for wonderful views. At dawn, New York has the forbidding character of a medieval fortress, enormously enlarged. 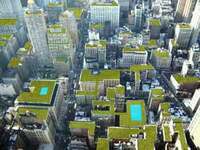 New York as it should be, topped with myriad green roofs and roof gardens . 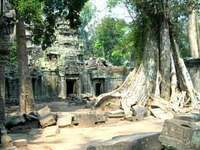 The overgrown temple city of Angkor Wat in Cambodia gives some idea of the way in which future urban landscapes are likely to be dominated by vegatation.